PHUKET: A 31-year-old man died instantly in a high-speed collision north of Phuket Town early this morning as he rode his motorbike across Thepkrasattri Road but into the path of an oncoming car. Lt Patiwat Yodkhuan of Thalang Police reported that Meknoi Seekaew, originally from Phrae province, was riding northbound along Thepkrasattri Road about 2:20am when the accident occurred. However, he was riding along the east side of the road heading north, against the direction of traffic. When he approached the U-turn at Baan Nai Kham, about two kilometers south of Thalang Town, he headed across the lanes so that he could continue his journey on the correct side of the road, Lt Patiwat explained. Mr Meknoi apparently crossed into the path of an oncoming Honda Civic car traveling at high speed southbound. The driver was unable to avoid the collision and Mr Meknoi died instantly, Lt Patiwat said. 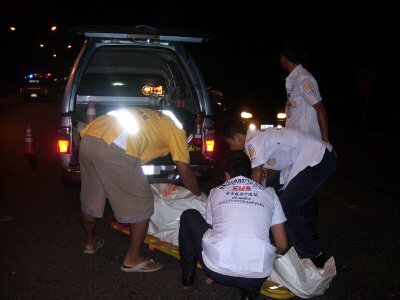 Mr Meknoi’s body was taken to nearby Thalang Hospital to be claimed by relatives. Phuket Live Wire: To 3BB or not to 3BB?